The goal of creating an independent, drought-proof local water supply for San Diego residents moved a step closer Tuesday after city councilmembers unanimously approved the Environmental Impact Report for the first phase of the “Pure Water San Diego” recycling program. The $3 billion Pure Water program will use water purification technology to clean wastewater that officials say will be safe to drink. 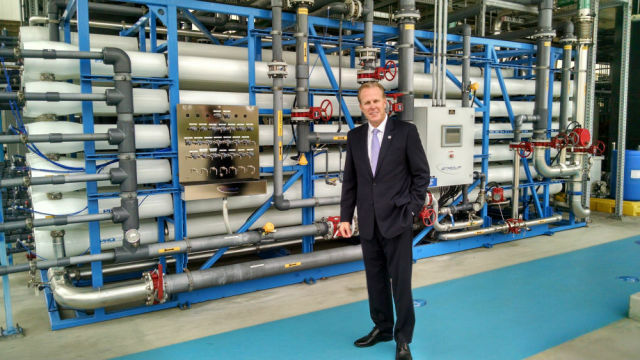 The new North City Pure Water Facility is scheduled to open in 2021 and is expected to initially deliver 30 million gallons of recycled water daily. The phased, multi-year program aims to provide one-third of San Diego’s water supply locally by 2035 through the recycling of up to 83 million gallons of wastewater per day. The first phase of the recycling program calls for new construction, upgrades to existing facilities and building of new pump stations and pipelines. The North City Pure Water Facility is slated to be constructed on a city-owned parcel east of Interstate 805 and north of Eastgate Mall – across from the existing North City Water Reclamation Plant. The second and third phases of Pure Water call for water facilities and pipelines to be built in the Central Area and South Bay, respectively. The Pure Water program also would divert wastewater flows away from the Point Loma Wastewater Treatment Plant, which treats wastewater before it’s piped into the ocean, according to a statement from Faulconer’s office. “That would allow for a higher level of treatment for wastewater and negate the need to convert the Point Loma plant to secondary treatment which would cost ratepayers billions of dollars,” the statement read. The Pure Water program is one of the major sustainability projects that support Faulconer’s Climate Action Plan.